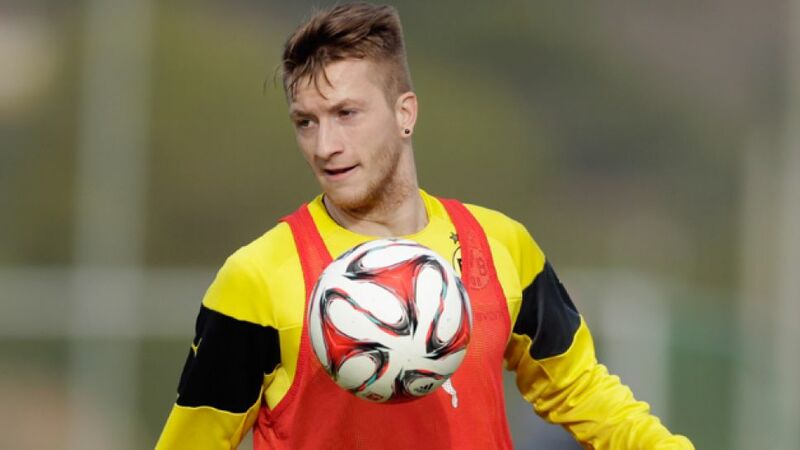 Dortmund - 2014 was a year of hardships for Borussia Dortmund superstar Marco Reus. Not only did he miss out on Germany’s World Cup-winning exploits in Brazil due to an ankle injury, but he also missed a large chunk of the first half of the 2014/15 season as a result of similar ailments, forcing him to watch from the sidelines as BVB faltered towards the end of the calendar year. Limited to just seven appearances so far this term, the 25-year-old has used the winter break to work on his fitness ahead of the eagerly anticipated Rückrunde. With Jürgen Klopp and Co. facing an uphill battle of improbable proportions in their bid to secure European qualification, Reus’ contribution could prove pivotal in die Schwarz-Gelben pulling off the near impossible. Klopp has claimed that he’s “not thinking about UEFA Champions League qualification”, but with just 12 points separating BVB and their namesakes from Mönchengladbach in fourth, Reus believes the club’s so-called crisis may yet be averted. Talking to ARD at Dortmund’s winter training camp in La Manga, the blonde-haired wing wizard shared his thoughts on a number of topics. "Yeah I’m doing really well. I’m really happy with my healing process and right now I can take part in everything [in team training]. Of course I’m still a few per cent short of full fitness, but we’ve been working hard and doing lots of very long, very intense sessions as we’ve still got a lot to make up for. It’s all ok though. I’m satisfied with how things are going and I’m just really happy to be playing football again." "Personally I haven’t set myself many targets, but as a team we’re expecting a lot of ourselves, which is obvious because in the first half of the season we didn’t play the kind of football we know we’re capable of and above all didn’t pick up the necessary points. That’s the most important thing. Now it’s critical that we pick up more points because that will help us rediscover our self-confidence, but we’ve got to collect the points first. Irrespective of how we win the game, we’ve got to get those three points." "There’s no getting away from the fact that our results and style of play weren’t right last year. We’ve had to tell ourselves that we’re making a fresh start, that we’re beginning with a new year and we’re all going back to Dortmund with a positive feeling. We’ve recently had some really good training sessions in which we’ve worked really hard. That’s the basic requirement, but what counts is what happens on the pitch. We can train to our hearts' content, but life will still be difficult if we don’t perform when it matters. At the same time it’s still important that we’re training hard and that we’re all fit. Hopefully that will pay dividends on the pitch." "I think [CEO] Hans-Joachim Watzke was right when he said that what’s important for us at the moment is that we’re all fit, that I get back to full fitness and continue to work on my fitness. Right now it’s irrelevant who says what or when my contract is going to run out. The only thing that matters is the club. It’s not about the individuals, but that we collectively work together to get ourselves out of this situation. That’s what’s important." "I’m handling it the way I handle everything. Nothing much has changed from five or six years ago when I wasn’t that well-known. There’s no reason for that to happen. I’m just a normal guy, both out on the pitch and in my private life, but there’s no reason to change. Of course it’s rather extreme when you’re being recognized everywhere, whether it’s on your holidays abroad or just walking the streets in Dortmund, but that doesn’t mean you have to change or are allowed to start thinking you’re a better person. Everyone’s the same and that applies to me too." "In terms of his character, Kevin is a great lad and he fits in well with the team. When looking at his style of play he mirrors me and certain other players in the squad and that’s exactly what we need. He’s cool under pressure, isn’t afraid of taking on his man and will stay tight to the man he’s marking. That’s important for us and I think Kevin has a big part to play and will help us in the Rückrunde."